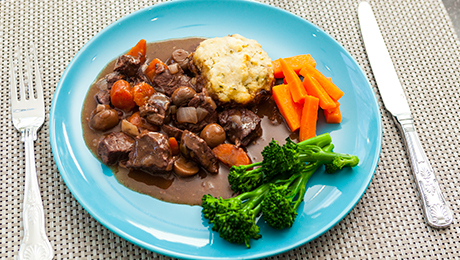 This classical French dish is perfect for all the family to enjoy! Heat a large pan with a little butter and oil and quickly brown off the meat in batches until it is browned all over. Make sure not to do too much meat at any given time because the meat will begin to stew as opposed to brown off. Transfer the meat to a large casserole dish when it is sealed off. Without washing the pan quickly brown off the smoked bacon lardons (optional) with the onions, crushed garlic and the button mushrooms. Add a sprig or two of rosemary and thyme and the bayleaf at this stage also. Add the diced carrots to this mixture also.Scatter in the plain flour over the onions and mushrooms and mix well over a low heat. Pour in the red wine and beef stock and continue mixing with a wooden spoon to combine the flour with the liquid and to thicken the sauce. Bring the sauce to the boil then stir in the tomato puree, then taste the sauce and correct the seasoning if you feel some seasoning is required. Pour the boiling liquid over the meat and cover with a tight fitting lid. Transfer to the oven for approximately 3-3 ½ hours. Don’t forget to take the dish out of the oven every so often (perhaps every 50 minutes to 1 hour) and give it a stir to make sure that the liquid has not evaporated off. Incidentally if it has you will need to add a little more beef stock. Meanwhile, make Chive dumplings: Sift the flour into a bowl and using you fingertips rub the butter into the flour until mixture resembles fine breadcrumbs. Make a well in centre of mixture. Add chives, parsley and buttermilk. Season with salt and pepper. Stir until just combined. Place heaped tablespoons of mixture, 2cm apart, on beef mixture. Cook, covered, for a further 15 minutes or until dumplings are puffed and cooked through. Serve. Delicious! The whole family enjoyed this dish.